As someone with self-confidence issues, the idea that God has built every one of us with unique spiritual gifts has always overwhelmed me. That would mean that of all the beautiful landscapes I’ve seen, the wonderful people I have known, that God still felt I was a necessary part of this world. How could this awkward, over-opinionated, less-than-magazine perfect woman have something to offer? Now consider that many women struggle with that terrible habit of comparison. Our inner dialogue often sounds like, “at least I’m not as bad as …,” or, “at least I’m better than ...” We often seek reassurance from spouses or other women in the group to soothe our worst fear- we might not be “good enough.” If you examine those statements next to the idea that we were each built with unique spiritual gifts, it sounds ridiculous, right? Still, it doesn’t stop us from doing it and emotionally wrecking ourselves in the process. Not even ranch women. For years, I have watched myself, and others, try to scheme their way to the top of some imaginary pecking order. This quest was fueled by some highly misguided belief that having the most political pull, best branding meals, best behaved kids, best business or cowboying skills or decorated home, would somehow earn extra points. Extra points with who? What is the prize in the end? Looking back, a lot of energy was spent into worrying that had no defined outcome. After ten years of stress, mistakes, lost friendships, and starting over, I have figured out one thing. NONE OF IT MATTERS! If you truly grab hold of the thought that we were each fearfully and wonderfully made, then there is no way to compare! When that happens, a beautiful thing occurs. Your heart is lifted as negative thoughts leave or cease to begin. You allow yourself to appreciate other women without animosity. You open yourself up to the blessings of their strengths! I will never be the best cook on the outfit but enjoy learning from those that are. I am not a makeup guru but smile at the praise and attention that gal receives as every other woman begs for her help on the ranch party day. My home is far from the cleanest or best decorated on the ranch but can use their efforts as inspiration to try a little harder. And cowboying? None of us are doing it full-time enough to keep up with the men so does it really matter? Where are my strengths in this whole dynamic? I have no idea and have learned that it does not matter. Someone else’s opinion of me is none of my business! So, I mind my business. I stay in competition with no one but myself. I strive to hear God’s voice amongst my numerous, daily mistakes. Yes, that word comparison still tries to sneak in and destroy my inner peace. Now, instead of allowing that dirty little word to take over my life with its lies, I remember one thing. 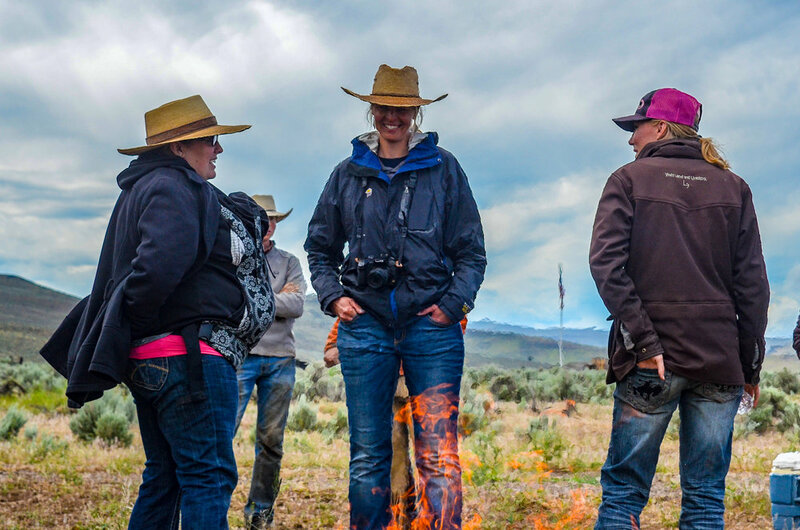 As we build this tribe of strong women- may they be business owners, ranch wives, or cowboygirls- what are your personal tricks for avoiding the comparison game? I would love to keep this conversation going in a future discussion because let’s be honest, motivation should be practiced daily!